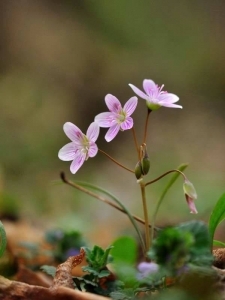 As a result of the year’s strange weather, annual wildflower walks being led by park rangers in southern West Virginia this weekend are expected to include the unexpected. The walks, which are scheduled at Babcock, Hawks Nest, and Pipestem Resort state parks and in the New River Gorge National River, will at least be the warmest in the 14 years the walks have been led, according to Jodi French-Burr, ranger for the National Park Service. All programs free, French-Burr reminds participants, who should bring water and wear sturdy hiking shoes for guided walks. Snacks, binoculars, a hand lens, and a favorite field guide are also useful. Participants are also welcomed to visit artists whose work has been inspired by spring in their studios at Tamarack from 10 a.m. to 6 p.m. daily. The art of students from Fayette, Nicholas, Raleigh, and Summers counties who were inspired by area wildflowers will be on exhibit at Tamarack daily. Saturday, April 29 — Meet at shelter No.4 at New River Gorge National River in Grandview. Join naturalists on a leisurely 2.5 mile hike from Grandview down to the New River, finding wildflowers and other natural wonders along the way. Be prepared for some steep terrain as we travel down an old dirt road. A free return shuttle will be provided. Reservations requested by April 24; call 304-466-0417 9:00 am to 1:30 p.m.
For more information on these programs and others, visiting the official Wildflower Weekend page for the New River Gorge National River. For more information call 304-466-0417.